Entergently: Curse you John Deere!!! I really enjoy cutting the grass. 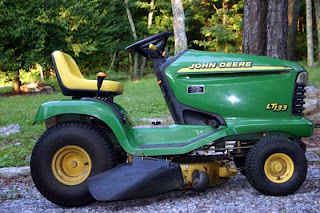 Growing up we had a push mower (self propelled thank goodness). We had to do all the cutting (5 girls in our family) and our yard was not small. I HATED it. It was hot and nasty work. 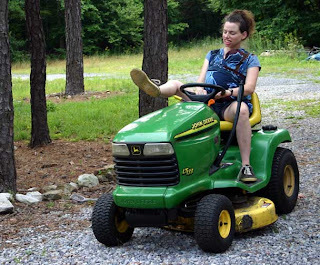 BUT, now that I am an ‘adult’ and have a riding mower I actually really enjoy it (I enjoy ‘riding’ equipment of any kind actually, I would love a Hog someday). I mow pregnant (sometimes like very pregnant) I mow wearing baby (see disclaimer above) not because I WANT to but because I often can’t put them down. It’s no biggie really, I just have to sit back and steer. So with Charlie doing so much work around the house (building storage buildings, additions, screen porch among a million other things) I am the one who cuts the grass and I am fine with that . . . as long as my mower runs!!! Our history with lawn mowers hasn’t been too great. The ones we have owned never seemed to work right, and even the time we used others mowers even they crapped out on us. 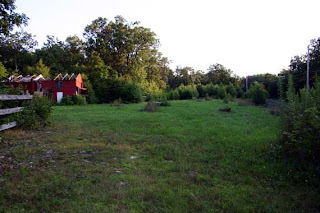 So when we moved out here (we have an acre and ½ to mow here) and bought a used John Deere (from Charlies dad’s friend . . . dirt cheep, probably 1/3 of what it was worth) I was thinking . . . FINALLY a quality machine that will WORK!! Well the problems started right away. OK it isn’t about the mechanics of the mower, the mower is really good. But everything like this needs maintenance. After the first cutting session we noticed the tires going flat, that is fine we just used the air compressor to blow them up. But it got worse and worse. Eventually we were having to blow up flat tires every time we cut the grass . . . so annoying! I mean it would take me 10 min to blow them up!! But the tires are big and expensive so I was willing to spend the extra time inflating them . . . for a while. Eventually we had to replace the blades too, which is fine. Our yard isn’t like a normal yard. 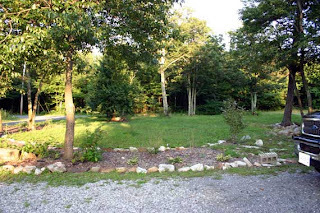 We are on top of a mountain and we have tons of rocks up here, so when you mow it is like you are going through an obstacle course, weaving in and out of things, going down slopes, having to stop to pick up rocks in your path etc. I try REALLY hard but I am also pretty hard on machinery, LOL!! I have lit up my fair share of large rocks in the yard! Needless to say, we replace the blades often, LOL!! Fast forward to last summer (08). It is September. I am like 7-8 wks pregnant with #5 and I have 24/7 nausea and am tired of course and ALONE. Charlie was working out of state for 2 months (because of hurricane Ike, he does insurance). We were planning a huge get together here for Xian’s birthday and I was trying to get ready (not easy being alone with 4 little kids and being sick and pregnant). So I was doing yard stuff, digging holes planting bushes etc. I mean shoot, I don’t care how sick and tired I am, if people are coming over I am going to make the yard/house look presentable. The grass was in dire need of cutting but I was trying to work out the logistics of how I was going to cut the grass with a 20 mo old who LOVED the mower and insisted on following me around when I am on it (and no one else here to really watch him). I figured I could distract him with TV and have Xian watch him in the house. I have it all planned out ahead of time. Those of you with kids know that there are ‘windows of opportunity’ during the day to get things done. Between fixing food, cleaning up, nursing someone, helping kids with things, playing referee, and doing e-mails in between, it is often hard to find time for ‘extras’ but if I plan right I can. Don’t even get me started on the days we go out . . . I get like nothing else done around here, LOL! (it takes so long to get them dressed and ready and then ½ an hour to get anywhere, I prefer to stay home most days). I also have kids to nurse to sleep for nap (and I nap with them). I usually can find time before lunch and before dinner. Most other things I do after they are in bed (though I can’t cut the grass at midnight). Anyway, I have to plan these things out and take advantage of the time when I have it. So when the time comes to mow, I have the kids fed and happy, I get Ever distracted, give Xian instructions on watching him (and not going outside) spend another 15 min trying to find the stuff to pump up the tires and then I FINALLY start mowing. I get about ½ way through when I hear a funny noise and the mower stops cutting (it is still running, just not cutting). UGH!! So I drive it to the house, lie on the ground and peer up underneath it and try to see what is wrong. Don’t ask me how I could see a thing up there but I could and it looked like the belt that is connected to the blades was off. I have this saying . . . I can function fine and get things done as long as the things around me (including computer and in this case lawn mower) are WORKING!! If they quit working, well, lets just say I get really stressed out (especially if I am pregnant and sick and tired and alone). I am so frustrated and I am so quickly loosing my ‘window of opportunity’ to mow. So I call Charlie in to vent and get his advice (he wasn’t a ton of help, though how could he be when he isnt’ there). I find the john Deere book to try to figure out what the heck the problem is. I get back on the ground look under the mower and see a wheel is off of the bottom which has made the belt come loose. Thankfully, the screws that had come off were sitting on top of the deck! I needed to put it back on but of course after a couple more calls to Charlie I still can’t find any tools which doesn’t matter because my ‘window’ is gone and now I have fussing, hungry, tired kids. The yard that needs mowing!! So the next day my goal is to fix the mower (did I mention I REALLY wanted the grass cut?). I find the tools, go out there, wriggle under the mower, and contort my body to reach everything (the book said to drop the deck but I was not going to go to that much trouble, my arms are small enough to fit anyway). And ya know what I did? I put the wheel back on and I put the belt back on (oh and did I mention I was newly pg and sick and tired?). I mean it was like a puzzle but I figured it all out. I get everything ready to mow again (myself dressed, the kids distracted, tires pumped up) and I start the mower put the blade down and it works!! Yes! I ROCK!! I start mowing feeling VERY good about myself. And that lasts all of like 5 minutes when the blades stop turning again. I am literally about to cry. I look up under the mower, again, and the belt is off and the wheel is stripped. I mean it is shot like it can’t be fixed or put back on, it is ruined!!! I was thinking . . . oh crap! I put it on wrong. So I went from feeling great to feeling like crap! Come to find out the bearings or something were bad and I needed a new wheel. But I am determined to fix this durn thing. It is SO much easier to have a husband who takes care of these things, but I didn’t have that option at the time and I went from feeling sorry for myself to being mad. I was me against the mower now and I don’t loose!! I can do any durn thing I put my mind to (always have). The John Deere place is on the way to soccer so on soccer day I stopped by. I handed them the messed up part and they gave me a new one. Then I double checked with them about putting it on (YES, I HAD put it on right!!) all while trying to keep the kids off of the mowers on display. This is how determined I was to have the yard look nice when we had people over, LOL!! The next day I did it all again like I did the first time, I fixed it, it worked (and still works). I fed the kids, pumped up the tires, distract Ever and mowed the lawn (thank you Lord). Let me say again I ROCK!! LOL!!! Fast forward to a few wks after Thrace was born. We finally got new tires like, literally 3 days before Thrace was born (because I told Charlie I was not going to pump up those tires anymore, it had been like 2 yrs, LOL). It is amazing how something as little as having good tires on the mower, and not having to pump them up before mowing, can really make my day!!! Charlie had mowed the last couple of times (I last mowed at like 39 wks and had trouble walking for a day after that, LOL). Thrace is just a few wks old but Charlie was out of town again and the grass was getting long and I was getting tired of looking at it. I really hate being at home all the time with the grass long and everything looking messy (we have enough mess around here, short grass makes the other mess look better, LOL). Sooooo, I decide to mow the lawn. 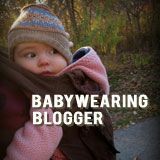 Now I have to plan things differently this time as I have a baby now (though thankfully I don’t feel sick and have more energy). So after much thought I make a plan. I have the kids fed, I have Dora on TV for Ever, I get dressed in my mowing clothes, I feed Thrace, change him, put on my wrap, spend about 10 min getting ear plugs in his ears (I had to cut them to fit), get him in the wrap and cover his legs etc. I prefer a wrap for cutting the grass because it holds them very snug to my body and I can cover all exposed skin . . . though . . . wait . . . what am I saying? That doesn’t matter because you are not supposed to be wearing a baby while cutting the grass anyway (see disclaimer above) DUH!!! So after about ½ hr of prep, I am ready. I head out to the mower and IT WON’T START!!! What the frack!! First time I have not been able to get this mower to start. I tried and tried, called Charlie for advice, tried again, called Charlie to vent, tried again, then I wanted to cry because like I said, I can function well as long as the equipment around me WORKS!! And I had such good intentions! Ends up Charlie couldn’t get it started either, it took a couple weeks before we got it running, right before we had another big birthday party at the house. But of course after we got the mower running we couldn’t get the weed eater running so Charlie went around the whole yard with garden sheers until his back hurt. Then he went to WalMart and bought a cheep electric weed eater, LOL!! But none of that matters because it wasn’t my deal, he was here, he was doing it and he the one stressing over it! OK, fast forward to a couple days ago. This is the last story I promise. So we are going out of town soon for vacation and the grass is LONG (hasn't been cut in like 3 wks) and it needs to be cut before we go. But again, Charlie is out of town for a few days and he won’t have time to do it, so I say I will. Once again I plan ahead. The FIRST thing I do is go outside and crank the mower . . . yes!! It starts right up!! Hallelujah! I sit there on the cranked mower thinking of what I need to do before getting ready to mow. I checked the gas tank . . . ooh, it is pretty low. So I called Charlie because I can’t find the gas can. And ya know what? It is EMPTY. Well I go off, just a little bit, because it would have been nice if I would have known that ahead of time (or if he would have filled it for me, much easier for him to do it than for me to get 5 kids dressed and drive to the gas station when we were not planning on going out . . . that right there is like probably an 45 min of my day). But he thinks I have enough in there to at least cut the front yard. Ok that doesn’t work with my plans (I was going to do the side yard first . . . I have my reasons . 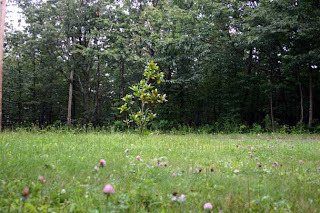 . . remember I have this planned out) but I figure I can do the front yard first if I have to. So once again, I go in the house, get dressed to cut the grass, I have the kids fed, get my wrap on, nurse Thrace, then I give Ever a ride around the driveway so he will be pacified while I am mowing (they are going to be playing outside and I don’t want him fussing for a ride). I am very proud of myself for being so on top of things and really planning ahead (hand. pats. back). So Ever and I get off the mower, I leave it running while I go in to get Thrace (Xian had him). I get him, put ear plugs in his ears (he wasn’t too happy about that) pop him in the wrap, head outside and . . . wait . . . something is wrong!! Didn’t I leave the mower running when I went inside? I DID! But it is no longer running!! I believe I said “no, no, no, no, no” or something like that! I go out, try to crank it . . . NOTHING! ARGH!! It was out of gas!! So much for me having gas to cut the front yard. It is pointless for me to get gas because if I do my ‘window’ is gone. I go inside, call Charlie and go off about how I have decided that trying to mow the lawn with all the kids here alone is just too stressful for me if the mower doesn’t work so I am not doing it again, he can do it!! (just a note, Charlie is wonderful, he works so hard around here and at work, so none of this is his fault, I was just venting and frustrated). Of course that was a bunch of bull. I think he knew that wouldn’t fly because if he isn’t here to do it he knows I will cut it instead of looking at a jungle all day . . . he knows me. He came home the next day (just for the night, not long enough to cut the grass himself) and got gas and filled the mower for me (because he knew if he didn’t and I had trouble lifting a 5 gallon gas can and couldn’t do it myself then he would NEVER EVER hear the end of it). I am really not hard to live with. really, I just want stuff to work!! Anyway, I am proud to announce that I mowed the front yard today!!!! Thrace doesn’t like being put down at all but usually after we nap in the afternoon he is in a great mood and will tolerate me not holding him, sometimes for as much as ½ hr (he doesn’t really like others holding him except for me unless he is being worn by them, but after nap he will tolerate it more). So after nap I nursed him and let him pee and I put him outside with the kids where they could watch him while they played in the sandbox (having older kids to help is wonderful). I could see them from where I was mowing the front yard and thankfully he was happy the whole time. He just sat and looked around at the trees and the kids playing. Good thing too because I had to get off the mower like a million times to pick up toys hidden in the long grass and that is so much harder to do when I am wearing him. Tomorrow I hope to mow the side yard. Though I have stayed up so long writing this and I have to pack tomorrow, it may not get it all done. Ah well, if I don't at least the front yard is done and at least I know I try. Here is the side yard today that needs to be cut. The field also needs to be cut, but Charlie can do that when we get back. Like I said in the beginning, I really do enjoy cutting the grass . . . as long as John Deere cooperates!! I can't believe I read this entire story. Wow MU, I can't believe you read the whole thing either, LOL!! You must be getting bored waiting for your little guy to come on out!! It is epic, but I didn't want to leave out any details!! Haha! You sound just like me! 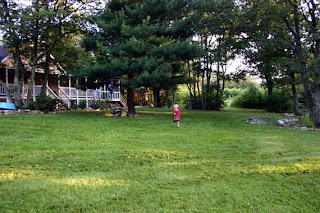 Us kids had to mow the lawn when we lived at home. We didn't have a push mower thankfully, but with TWO riding lawn mowers it took about FOUR HOURS to mow my parents lawn. Big lawn! Anyways, now I'm not really 'allowed' to mow our lawn cuz I keep breaking the mowers. Ooops! Really a result of buying old used ones and running them for too long at once. So sorry about the frustrations with the mower not working! Ahh! I feel your pain!